Because the cosmos is lit with magic and full of wonderment, it contains inside it all the reactive elements needed to create new universes inside itself. With the flit of a small set of wings, so much can be changed, created, dismantled, renewed, and restructured. In the merest of moments, entire universes can collapse into vague nothingness — floating particles and embers faintly blinking with the memory of the kinetic life that once was. In a bang (tiny or gigantic), there is a collision! Two people — separate beings with mutually exclusive social matrices never before having shimmied past one another in this universe of undulating molecules — suddenly collide. And in that moment (tiny or large) of collision — a glance, a word, a pause, a misstep, a clank, a footstep, a brush — those entirely separate beings become cosmically intertwined. Perhaps the people will quickly free themselves from the moment, untangle their elements, and part. But, then again, perhaps the moment of collision carries with it all the cosmic elements of creation and in that moment – bang! – the pair of strangers silently and perhaps subconsciously aware of the cosmic shift toward one another become enmeshed in an instantaneously beautiful, sparkling union. Hand in hand. Eye to eye. But since it is not so…. Any singularly creative spark in the cosmos may be ignored by two people unaware… people do not collide in this manner. People collide in much clumsier ways, erecting complex webbed surrounds to house their insecurities and fears and secret wants and politeness and confusion and rules. Unable, for some reason, to be vulnerable in the arms of one another floating out in the dense, hot expanding arms of the universe. People tether themselves to their extant environments, sheltered from becoming adrift in the unstable elements of the cosmos. Today I ask this of the cosmos: could there ever be a single collision so powerful it changes the fibrous composition of its creatures? I believe that amazing new creations can form out of nebular messes. I believe that this rag doll could come to life with a little cosmic magic. I believe her heart could beat in the palm of tenderness. Can we have a little tenderness? A little honesty? A little feeling? A little plain talk? A little collision? I don’t date because I rush in… When I begin to feel, I feel deeply and fall into the cosmic chink completely untethered. I do not date. I fall fall fall fall. I hope with desperation that I will be wanted as much as I want others, and that others will be able to tell me how they feel and what they want. My best friend does not date. She cautiously unravels the universe’s cosmic fingers and unhinges herself from the moment of collision. Or she too jumps in and recoils, like I, when others fail to tell us how they feel. We do not participate in the dating game (for surely so often it is a game with winners and losers yet few ties) …. too tired for the rules of it, bereft of all the needed pieces for the match, wishing hopelessly for a games chancellor to assure the fairness of things, wanting instead to jump lightfooted out of bounds — to say how we feel, what we want, what we hope for, what we need and to embrace the moment, the person, in our arms beset with radiating light. While we love wordpress in so many ways, it is a little limited. We wish we could paste our imeem player in this post for you to hear, but we’ll have to settle for a lil link instead. So jetset yourself here to listen to our mix of the year’s best cuts: 2008: The Year in Songs **HINT** If you wave your mouse cursor over the linked songs in the above list like a magic wand, a pop-up player will appear for your listening pleasure!! Where are the diamonds of yesteryear? Where is this year’s “Rise Above”? There just isn’t. but nothing that stands up by itself outright and promises to be timelessly classic and shattering! Best New Artist: Olga Bell!! sparkling electronics — oh how it does befit her surname! Best Guilty Pleasure of the Year: Those Dancing Days (I love Swedish teenie boppers, I really do!) and Ben Folds with Regina Spektor (of course, of course) — these songs truly tested our virtuous fortitude! — how many EPs and a full length this year? How do I even begin to sort through it all? Even more overrated — MGMT… ugh… Can we live that down yet?! Still not sure about: -Johnny Flynn and the Sussex Wit? Larkin Grimm’s “Parplar”? And this, this is the story of survival. Survival begins much uglier than you might think. It begins with guilt and shame and a desire to fade into the white and the flurry of fragments — of self and storyline and understanding. The story is a blurred and spinning motion show. It is circulating cascades of colors and lights and fragments of faces and pieces of periphery. The story of survival is substantial, but it is not ordered or ordinary. It is out of order and spinning spinning spinning spinning. And so, in the face of our own survival, with the force of bed spins weighted at our temples, we begin here: We failed the challenge. We did not produce 50,000 words in 30 days. We plunged into the starkly cold early winter waters, foraged in the dark depths with our toes, and fought against the current. Yet we could not hold our breath until the end. We bubbled to the surface just shy of ourselves, just short of discovering our inner underwater worlds waiting to be exposed, written and read. We nearly made it and yet we did not. There are thousands of reasons why we did not make it. Which would you like to read? Which would you believe? Which reason suffices power and force enough to yank us up from submersion in our inner selves just as we are about to discover a new lifeform and bring it to the surface for questioning? Well it begins here: somehow we lost momentum, our tethers tensed up and flung us away, and our surface selves beckoned our immediate attention. For me, my dear car was totaled and I was called to a different reckless adventure in search of new mobility. For Ms. Bernstein, graduate school and cold weather and the indescribable and unexpected arrival of foreignness in another country pulled her outward of her attempt. And although the story of our survival begins there, it does not end there. For, though we did not meet our mark, though we did not produce our 50,000 words, though we did not amass a new lifeform — we did not fail. It does not suffice our survival — our bravery, our attempt, our experiences. We nearly made it, but we did not fail. I do not call FAIL. Not just yet. Although we did not surface with an undiscovered underwater lifeform in arms, we do not defy its existence. We have circumstantial proof only, but we have enough not to deny the truth of possibility. Our NaNo novels are non-mathematical postulates, non-logical axioms. They are truths waiting to be proven. Words waiting to be counted. Virtual pages waiting to be given tangible life in ink. Feral children waiting to be given homes and parents and structures and culture. We have characters who, alternately, have stories and lives and words and creatures for whom they are responsible. We have towns that do and do not exist, alternately — for they exist in our storytelling and perhaps even in actual space. We have much to prove. We have much yet to do. I do not call FAIL. Not for us. Even if failure is the best word we have available in our present, shared lexicon — failure itself is a story. In fact, it is an internet meme. It is a phenomenon of virtual culture. It is globalized. It circulates the global in intangible form at unimaginably rapid speeds. It is shared by thousands and thousands of people, strangers to one another, each day (on different days in the world and in the world’s time). Even in this photograph, fail is called for an ironic and probably, in all likelihood, unintentional shelving order for a bookstore in NYC (that same bookstore that gave away the free postcards that my Bernstein used to mail me delicious bites when she was an undergraduate student first living in the great wide city). But even this failure is not failure. Failure does not suffice this photographed shelf. Failure does not suffice its irony and subtextual meaning. Failure does not suffice metaphor. Our NaNos exist betwixt — betwixt the truth and fail — betwixt success and failure — betwixt sexuality and relationships. We have not failed. We have only just begun. And we shall not let go. Her frescos have been used in this entry to evoke the inner experience of survival and its complexity (shame and happiness and selfishness and selflessness and inner exploration). 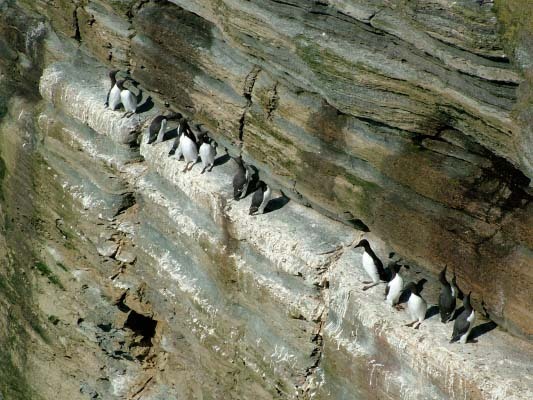 The guillemot (a European bird much like Bernsie, herself) hurls itself off a precipice before it is fully fledged, not as a test of will or wings, but as an instinctual following act just a few steps behind its mother. And the fledgling guillemot doesn’t stick the landing. It doesn’t even fly. The guillemot feels weightless in plummet just moments before it crashes to the rocky beach below. But even as it crash-lands in the grit, the guillemot is not unsteady. It dauntlessly, haplessly perhaps, picks itself up and continues its relentless waddle to the water. What mother leads its young into a hopeless crash dive off a cliff that doesn’t end at the sand below, but continues to drive forward into the great blue deep? Each morning I wake up hoping to have grown in my flying feathers, and though I have what appears to be feathers growing in, I still can’t fly! I have my own nest. I even have a flock of young creatures (not of my own species or procreative efforts, of course) to look after — think Jean Piaget flock of ducks. And, yet, I continue to feel unfledged. I can’t save a dime. Alright that isn’t exactly fair, I have managed to save a few dimes with my save the change account that rounds off my debit purchases and puts the extra pocket change into my savings account. But it doesn’t ever seem to amount to much. Because all I ever do is move my money around to delay its expenditure until it is appropriately allocated. Then, by month’s end, I’ve nothing more than a few spare dimes to save. I don’t know much about credit, but what I do know is that it is very difficult to build and very easy to obliterate. I’ve bombed my credit off the map! And it isn’t as fun as you might think it sounds. I only have one credit card and has a very modest credit line. Trouble is, my credit card has been my emergency safe and I’ve had more emergencies in my young adulthood than I had ever planned on. So even though my actual debt is fairly minimal, I’ve only one credit line and it’s close to max. I can’t seem to pay it down because my interest rate is horribly astronomically bound (we’re talking black hole big). And the credit company won’t offer much to help. So I slowly pay pay pay pay pay what little I can here and there throughout the month. It’ll work. It just takes time. A slow drip drip drip of time into a tiny bucket of dimes. All the while, I spend my time practicing to be a fledged adult. I try to keep a responsibly clean and organized apartment, and I try to get my oil changes regularly, and I try to forecast a future for myself at my job. If I squint hard enough at the horizon, I can envision a doable future of flight. I can see it! But how the hell do I get there, do I just keep hurling myself off the precipice hoping to either fly or make it to the bottom in enough pieces to walk myself to the water? It isn’t a new theme. It isn’t a new question. You see, like the guillemot, women are born with sea legs and have to learn to walk on the land of men. Maya Deren, “At Land” (part 1 shown), 1944. Time is built into my body in a sense of becomingness. But what am I to become? What is to become of me? That is a question that can only be answered in the air drift en plummette. That can only be secondarily confirmed by the sea. If I can make it to swim in the kelp, even if I become enmeshed and tangled, I’ll know, like the young guillemot, I have made it at least so far.